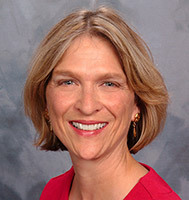 Dr. Betsy Trowbridge, a clinical professor of medicine with the University of Wisconsin School of Medicine and Public Health, serves as division chief for General Internal Medicine as well as Associate Vice Chair of Primary Care for the Department of Medicine. Under her leadership, General Internal Medicine has grown in size and has become a leader in Quality and Innovation. Dr. Trowbridge has also helped lead the primary care redesign effort at UW Health. This has included developing an innovative population-based compensation model for primary care.